Professional review of Boots No7 Smooth & Improve Cellulite Treatment. See how it compares against other cellulite creams. Overall, we really like Boots No7 Smooth & Improve Cellulite Treatment– especially for those on a budget. Instead of containing tons of cutting-edge ingredients, this one sticks to the tried-and-true basics like caffeine. It blends really easily and smells absolutely fabulous– one of our favorites in that area! It’s not all sunshine and roses though as we really don’t like the “rollerball” applicator that comes at the end of the tube. But despite that, this is a good, lower-priced cellulite cream, that’s sure to work well for many people. Boots No7 Smooth & Improve Cellulite Treatment comes out of the tube as a white, very slick gel. We actually like the texture of this one quite a bit. Applying this cellulite treatment is easy, once you get the lotion out of the strange applicator. This product has a five-head “rollerball” design on its end that’s designed to help massage the skin as you apply it. We found this contraption awkward and not really necessary. As for the lotion itself, it blends really easily and is a snap to spread over the skin. Boots No7 Smooth & Improve Cellulite Treatment dries extremely fast. In fact, it’s one of the quicker-drying cellulite creams we’ve dried! The smell of this one is delightful, in our opinion. 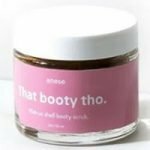 It’s very fresh and clean smelling– which is something you can’t say for most cellulite creams. Once on the skin, the scent of this lotion actually gets better. All-in-all, this is one of the better-smelling products on the market, whether it’s in the bottle or on your skin. 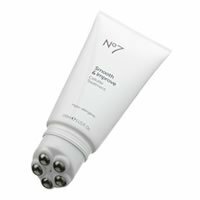 Boots No7 Smooth & Improve Cellulite Treatment makes skin feel extremely smooth and soft immediately after use. Does it get rid of cellulite right away? Of course not, no cellulite cream, does that. But in the short term, we really like what this product does for the skin. Longer term, Boots No7 Smooth & Improve does exactly that– smooth and improve. Over time, our cellulite definitely appeared less noticeable and the skin in those areas was very soft and smooth. Our skin also felt more very moisturized and just healthier overall. The ingredients in this one are kept to a minimum. At just 29 total, that’s quite a bit lower than most cellulite creams. Rather than getting fancy or doing anything cutting-edge, it looks like Boots has stuck with the tried-and-true ingredients like caffeine, euglena gracilis, and glaucium flavum. While basic, those ingredients have been shown in studies to have some value in reducing the appearance of cellulite. Boots No7 Smooth & Improve Cellulite Treatment costs only $19.99 for a 5 oz tube. I say “only” because this is definitely one of the least expensive cellulite creams out there. For those who are price-conscious, this is a very good choice. Unfortunately, this one doesn’t come with a guarantee. The website says you can return it within 30 days, as long as it’s in “new” condition. To buy Boots No7 Smooth & Improve Cellulite Treatment, click here.